The Agent Profile page forms part of the ‘Find an Agent’ project. The page is used to display a profile for each real estate agent in Australia. For the first time on realestate.com.au, agents are given the opportunity to express their own identity, and showcase their approach to the industry. The goals of this project were clear – to produce and publish a profile page for every agent in the country. These profiles would be linked to from our property listings on all channels, and ultimately come together as a searchable database of agents. With full access to the profile of any agent, consumers (mainly property vendors) would be more informed and less stressed during their agent shortlisting process. The profiles would also provide a property-centric boon for the industry, showcasing detailed contact and biographical information about an agent alongside their on and off-market properties. As the primary designer on this project, I worked with a cross functional team through the thinking, planning, design and build stages over 12 months. I collaborated with consumer and customer product managers, market research staff, and others to develop a solid core product offering. Also, I worked closely with developers in Australia and China. The product managers and I balanced principal, agent and consumer needs to ensure our design satisfied and improved the presentation of agents on our website for all parties. With the head of design and residential design team we worked together to align the design of the Agent profile template with our current website, our current projects, and our future direction. I produced wireframe documents, interactive prototypes and high resolution mockups throughout the project. A parallel responsibility of mine included informal leadership over the UI kit. I facilitated testing and iteration of UI kit elements through my work on the Agent Profile design. The uptake of the Agent Profile template has been a big success for the REA Group, with total profile views reaching 2.61 million views, months ahead of schedule. An important metric is ‘updated profiles’ those which have been edited since launch and include new data. The number of updated profiles currently sits at 24,257. This indicates 48.5% of agents in Australia see the value, and have taken the time to update and complete their Agent Profile since our December 1 2014 launch date (approx 4 months). Our user testing hypothesis was validated almost instantly – that profiles containing authentic agent information coupled with quality imagery that reflected the agent’s personality would be make potential vendors more likely to shortlist the agent. Inside the business the impact was also felt. 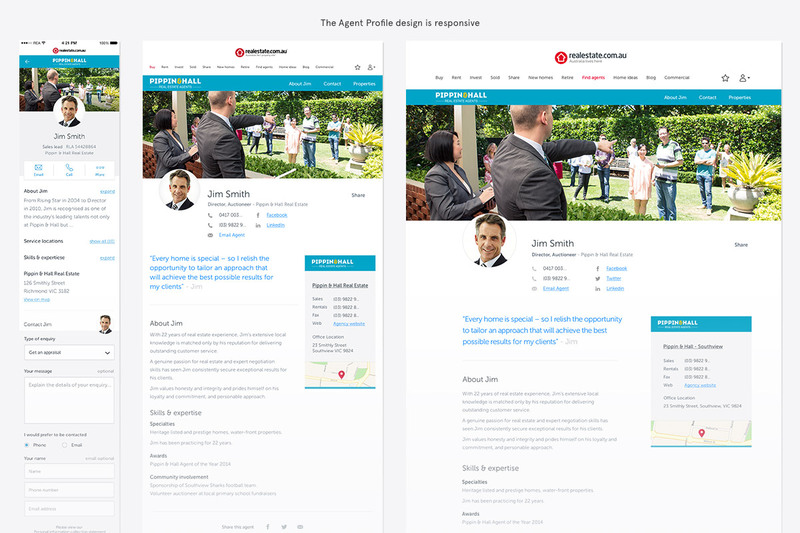 The impressive look and feel of the profile, coupled with the exposure it provides to agents has bolstered our focus on designing and shipping an update to Agency Profiles. We have recently run a national competition to further drive awareness to the profiles – the profile of the winner Brent Mason is shown below.